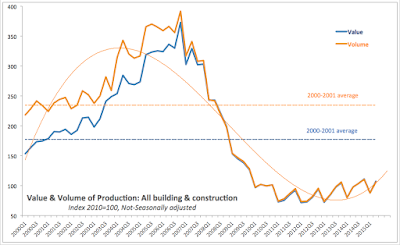 Having looked at the relationship between PMI and actual activity in Irish Building and Construction sector in the previous post, now, let's take a closer look at the CSO series for actual activity in the sector. As a starter, consider the current consensus view of the ongoing strong recovery in the sector. All data not seasonally adjusted, so we are looking at y/y changes here. 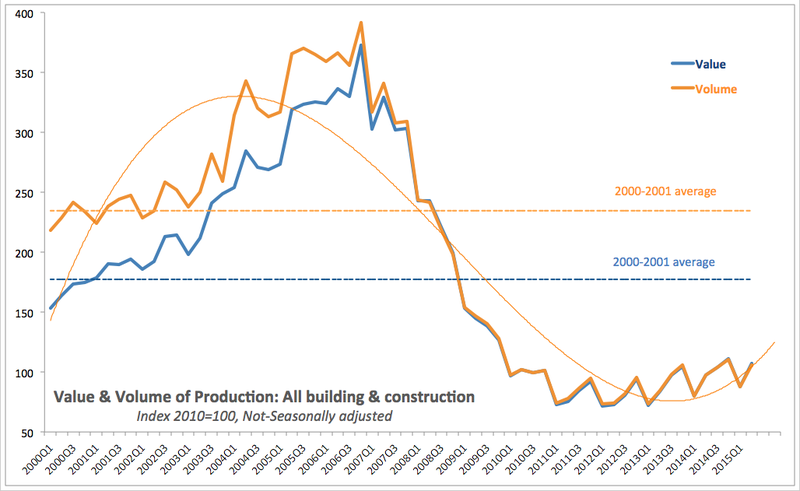 Total volume index for production in Building & Construction sector in Ireland was at 106.0 in 2Q 2015. This represents a rise of 8.72% y/y, second strongest increase in last 4 quarters. Compared to 1H 2011 the index is up 39.47%, seemingly confirming the overall story of strong recovery. However, the problem is that this recovery has been off horrific lows. Compared to series peak, activity in the sector was still 72.9% lower in 2Q 2015, and current levels of Building & Construction volumes are 53.7% below their 2Q 2000 levels. For the sake of another comparative, today's reading of 106 compares to 2000-2001 average reading of 234.6. Residential Construction volume index stood at 112.6 in 2Q 2015, up massive 45.7% y/y, and up 58.9% on 1H 2011. Again, levels of activity are still weak: the index is still down 88% on pre-crisis peak and is 77.7% below 2Q 2000 reading. Non-residential building volume index reached 113.3 in 2Q 2015, up 7.9% y/y and 26% ahead of 1H 2011. The index is still down 41.4% on pre-crisis peak and activity in non-residential building sub-sector is 33.4% below 2Q 2000 reading. Civil engineering is the only sub-sector of the Building & Construction sector that is posting activity above 2000 levels. Current index at 92.6 for 2Q 2015 is, however, marking a decline in activity compared to 2Q 2014 (down 14% y/y). Compared to peak activity, the index is 43.9% lower today, but it is 16.2% ahead of activity registered in 2Q 2000. Total value index for production in Building & Construction sector stood at 107.1 in 2Q 2015, up 9.85% y/y, marking, once again the second highest rate of growth in the last 4 quarters. The index is still 71.3% below its peak reading, and is down 34.6% on 2Q 2000. Current reading of 107.1 is well below 2000-2001 average of 177.2. Conclusions: overall, the recovery rates in the sector have been driven (to-date) by the low base from which the recovery is taking place. Double-digits growth is hardly inspiring when it happens in an environment where actual levels of activity are massively below where they were 15 years ago. That said, growth is better than contraction.